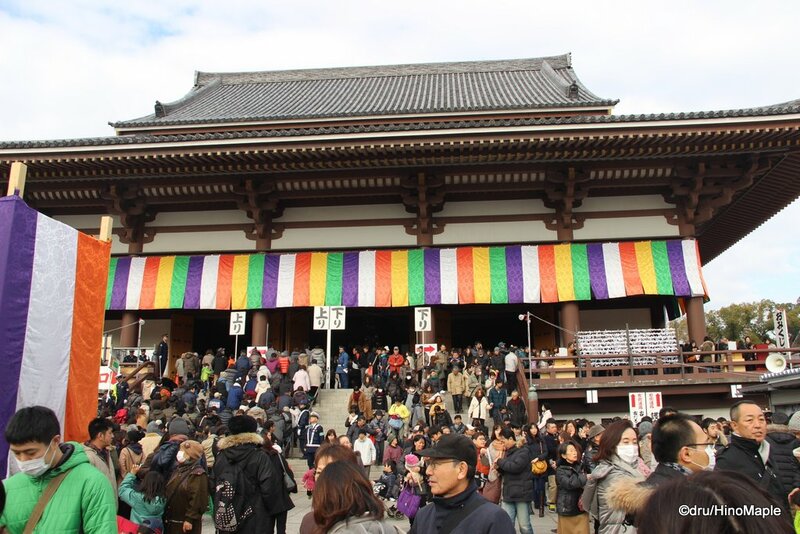 Nishi Arai Daishi is a famous temple in Tokyo but it is not a regular temple that tourists will visit. It is located in Adachi-ku just off the Tobu Skytree Line. It is within walking distance of the Toneri Liner making it a pain to access for people living on the other side of Tokyo. 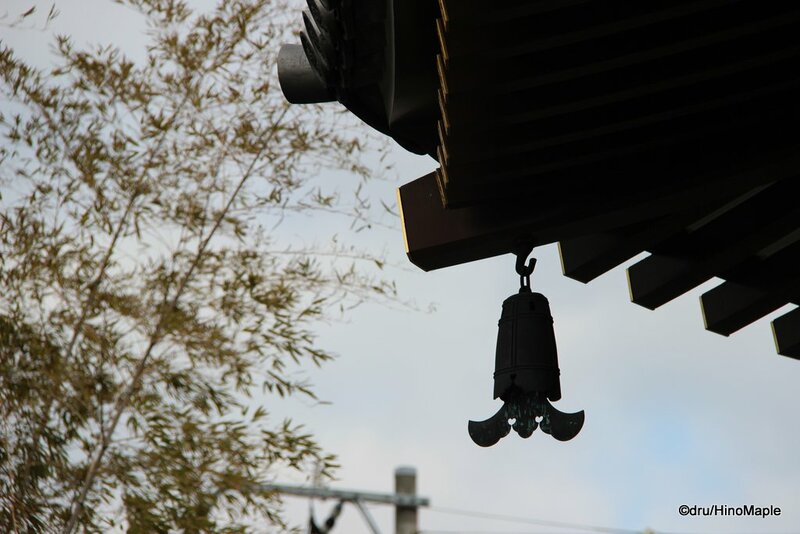 It isn’t hard to get there but being the most important temple associated with daruma, it is a popular temple. I made the difficult decision to head up there during the New Year events and needless to say it was packed and not a particularly enjoyable event. I do think it is a beautiful temple and I’ll revisit the temple again in the future to fully understand what it is like when it isn’t as crowded and I can actually see the temple itself. 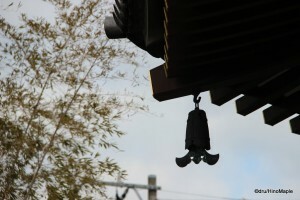 I went to Nishi Arai Daishi because it is reputed as the major daruma temple in Tokyo. 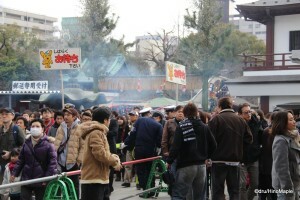 Every year on Setsubun they have a special daruma burning festival at the same time. 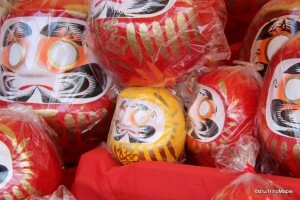 While many people go for Setsubun, I hope to go to see the daruma burning someday. They make special prayers before setting the old daruma on fire as an offering to the gods; it sounds more interesting than it probably is. I have seen a few offerings for the various religious objects in Japan but it isn’t as interesting as they make it out to be. If you are lucky, you can hear the priest saying a few prayers before they start burning the objects, but often you just see them on fire. Nishi Arai Daishi is famous for their daruma and it is one of the few temples in Tokyo where you can buy daruma relatively easily. 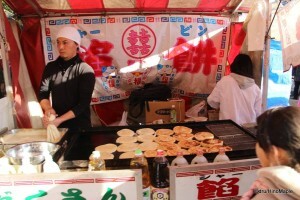 During the New Year’s events, they had daruma at a few different stalls run by different people. My goal was to buy a red and blue daruma for this blog and HinoMaple as well and you can read about my goals here. The people running the shops were old men and they were pretty rude, but playful at the same time. At the first shop I visited, the old man kept pushing the bigger daruma and calling the smaller ones “taruma”. It is a play on words to say the smaller ones were not as significant compared to the big ones. Large daruma usually have orange “halos” around the eyes where the smaller ones don’t. The smaller ones are often simple ones that don’t have many features. I went to another stall and the guy kept pushing me to buy. He kept saying that I was going too slowly and I should just hurry up and buy it. While I felt him rushing me, I didn’t feel like rushing so I ignored him a little. I ended up buying what I wanted but if you go to the shops and want less pressure, look for the only woman selling the daruma. I would have bought daruma from her if she had blue ones, but she didn’t so I had no choice but to go to the male pushers. The daruma at Nishi Arai Daishi are also cheap. Compared to the ones I bought at Kameido Tenjin in 2013, these were a steal. For a couple of smaller ones, I paid 300 yen each. Mini ones are even cheaper and larger ones are about 1000 each. It can be pretty expensive if you buy one that is the size of a G3 iMac but I don’t think I’ll be buying one of those anytime soon. The entire area was full of the festival spirit. To get to Nishi Arai Daishi, you have to take a spur line from Nishi Arai to Daishi Station. You have to use your ticket to transfer at Nishi-Arai but you are immediately on a special platform for Daishi Station. Daishi Station is so small that they don’t have any staff there to check tickets. You can buy tickets from the staff but you don’t have to worry about ticketing as it is mostly done at Nishi Arai Station. Once you get out of the station with the hordes of other people, you have to turn left if you want to pray in the New Year. If you don’t, you can head right like I did and see all of the food stalls. It was a lot of fun but bring your patience cap and be sure to have a beer or two, either before or during your time there. They had all of the traditional stalls with things from Amazake to a Nishi Arai Daishi specialty, “shapin”. Shapin looks Korean but it is from a Chinese restaurant in the area. It is akin to a flat thick gyoza and it was pretty good. There are other dishes that are good but I think I’ll have to wait till my next trip to try them. They do have special events every month on the 21st so if you want to plan a time to get some good food and buy a daruma, the 21st is the best day to do it. 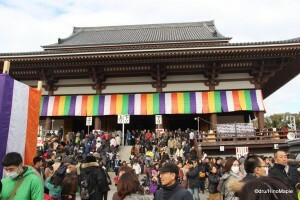 Other special event dates will be the same but regardless of whether there is an event or not, the 21st will always have the temple’s festival. Nishi Arai Daishi looks like a great temple. 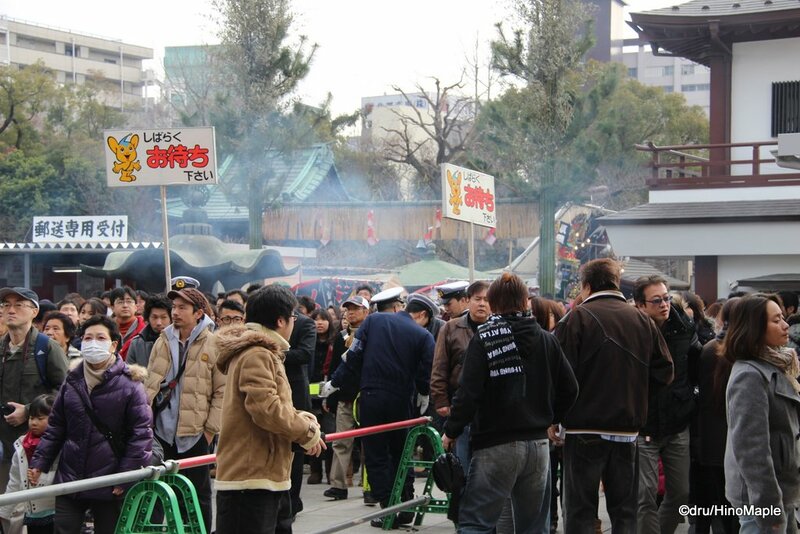 I hope to visit it on Feb 3 someday to see the Setsubun festival as well as the daruma burning. The earliest I’ll get to see it will be in 2015 as I will be a bit busy in February 2014. I will have to visit Nishi Arai Daishi at another time before then so I can enjoy the temple as it should be enjoyed, when it isn’t too busy. The best times to visit will be during the plumb blossom, cherry blossom, or the peony season as they have many of these plants. They also have wisteria but only one small section so I don’t think it would be worth a visit. If you do happen to be heading up that way, it doesn’t hurt to make a quick stop at Nishi Arai Daishi to enjoy the surroundings. This entry was posted in New Year's, Tokyo and tagged Adachi, Adachi-ku, Daishi, Daishi Station, Daruma, Hatsumode, japan, New Year, Nishi Arai, Nishi Arai Daishi, Nishiarai, Nishiarai Daishi, Nishiaraidaishi, temple, Tobu Skytree Line, tokyo by Dru. Bookmark the permalink.